Make this personalized Hope and Love throw pillow and excellent gift to show encouragement, faith and strength. 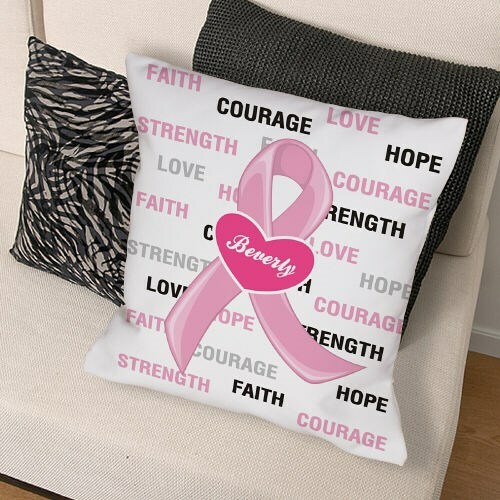 This unique Breast Cancer Awareness pillow accents any living room, family room or bedroom and makes all who visits know it’s important to be aware of breast cancer. It is just one of our many great breast cancer awareness products to help show your support. Our Custom Printed Breast Cancer Awareness Throw Pillow is available on our premium 9.5oz Canvas Pillow Sham, White, 14" x 14". Pillow Form is a soft, resilient, bouncy; polyester fiber form. Includes FREE Personalization. Personalize your Hope and Love Throw Pillow with any name. Additional Info MyWalkGear.com has many additional Personalized Breast Cancer Items for your special gift giving needs. Each time a gift is purchased from our Breast Cancer Awareness line of personalized gifts, MyWalkGear.com will make a donation of 15% of the purchase price to help in the fight against breast cancer.